£50 deposit secures your Holiday, we also require a £100 security bond which is refundable at the end of your holiday and we have inspected our Caravan . Some short break's may be available ( No Weekends). 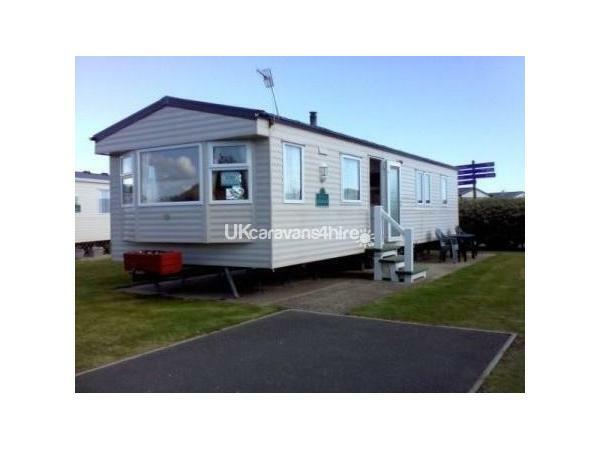 A modern Spacious immaculate 3 Bed 6 Birth Double Glazed Caravan with full central heating situated on Gull Court at Greenacres Holiday Park. 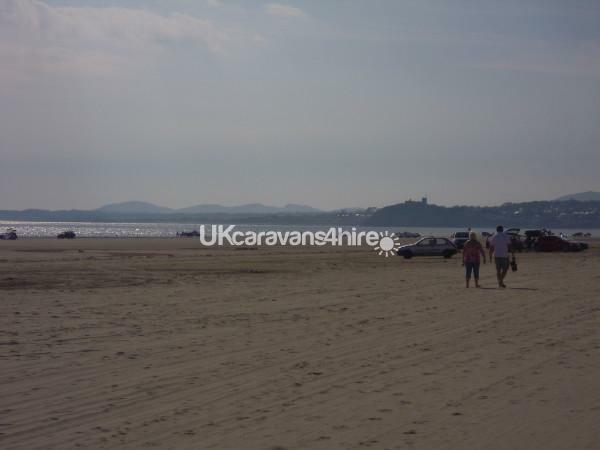 Our Caravan is a few minutes walk from both the entertainment complex and Black Rock sands with views of the LLyn Peninsula, Criccieth & Harlech Castle's and also the Snowdonia Mountains. The Spacious Lounge area consists of a Gas Fire, Flat screen tv, Sky tv a Dvd player with a selection of dvd's. 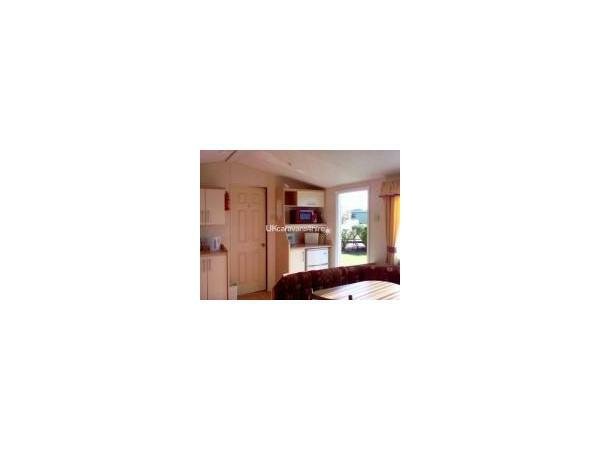 Kitchen area is fully equipped with a full size cooker, Microwave,Toaster, Kettle, Fridge freezer,Ironing Board with Iron and a Vacume cleaner. 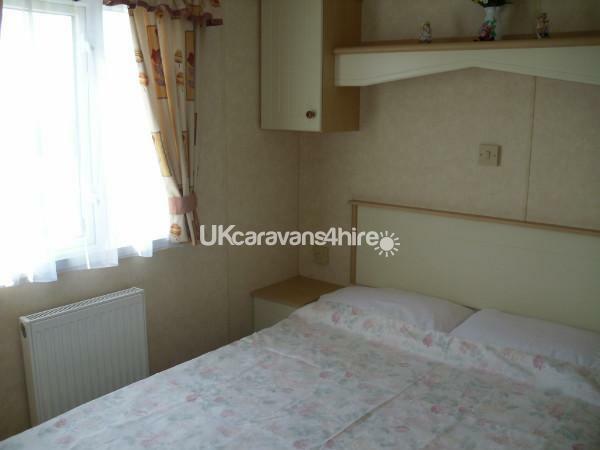 It is also well equiped with Cooking utensils,Crockery and Eating Utensils for 6 People. All Bedrooms have Wardrobes,storage cupboards, Bedside cabinets and mirrors. Bathroom consists of a walk in Shower, wash basin with mirror and storage cupboard, you will need to bring your own towels. There is a seperate WC. Outdoor Furniture with seating for 6 people is provided, there is also a picnic set that can be used for alfresco dinning. We provide Duvets and pillows you will need to bring your own Sheets,duvet and pillow covers. 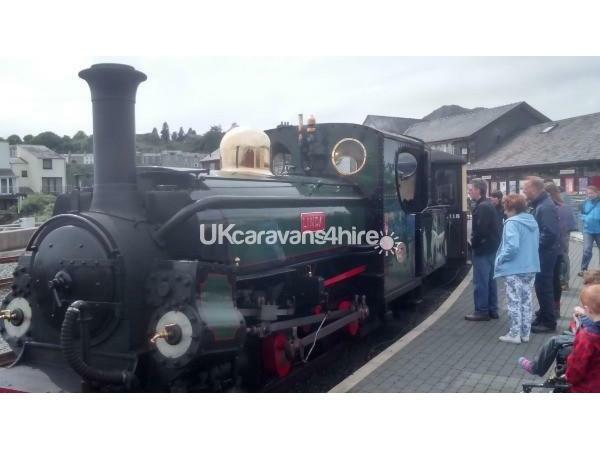 The Town of Porthmadog is a short drive away (or you can walk along the Coastal path and stop at Borth y Gest on the way) with its shops, cafes and bars, why not call in at spooners for a real ale situated on the platform of the FFestiniog Railway Station with views over the Glaslyn Estuary. A £50 Deposit is required to secure your Holiday. We also require a £100 refundable security bond. We let our caravan out for whole week holidays running from Saturday to Saturday, Some short break's Mon to Fri may be available (No Weekends). Additional Info: Bowlingo, Soft play area, Outdoor splash zone, Fenced ball playing area, Crazy Golf & Millies Cookes. We brought our kids (age 3 and 8 years) to Will and Jan's caravan on Gull Court for a weeks holiday and was pleasantly surprised at the lovely caravan greeting us. As in the previous review the pictures do not do it justice. It was immaculately cleaned and very well stocked with kitchen utensils, plastic crockery as well as porcelain and even DVD's in the cupboard. The TV has a sky box but with basic channels only. Unfortunately we had to turn on the heating during our stay and both the gas fire and the central heating worked wonderfully and we were toasty and warm whilst it chucked it down outside. The shower is brilliant and well able to cope with sandy kids and wetsuits. There is a nice grassed area right outside the caravan which was great for the kids to play on and the cul-de-sac was mainly free from traffic. Location is fab as a short easy walk to both the beach and the main building. I can't actually think of any downsides......apart from some written instructions on how the boiler works would have been useful, but Jan was available by phone to talk me through it (i can be a little special at times:D). Highly recommend Will and Jan and their van. They were always easy to get hold of and booking process, refund of bond and paperwork required all dealt with easily. We will be booking again i'm sure. We booked last minute and found Will to be very accomodating to our requirements for dates, and short notice. 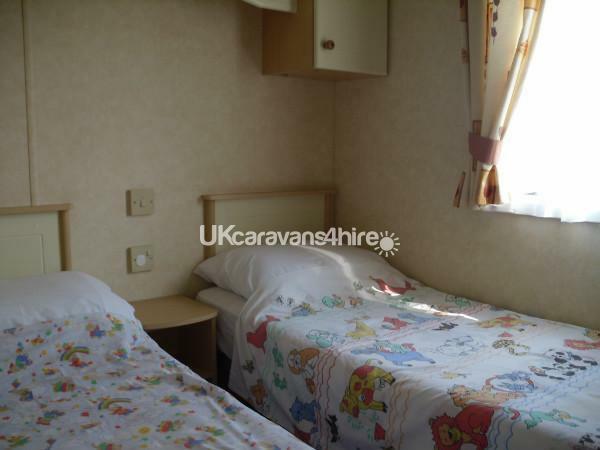 On arriving, the weather was beautiful, and the caravan is sited in a quiet area of the park, ideal for a more relaxing holiday. The van was immaculate, and very well laid out, dont be fooled as the pictures dont do the van justice to how nice it actually is!! Patio furniture is available, and a large area to the side, so perfect for barbecueing in the lovely warm Welsh weather! only a stonesthrow from the beach as well, but watch out for seagulls! There is a large amount of storage space, and the kitchen is well provisioned with pans and utensils, and has been well thought through in the main, making any stay easy and enjoyable. Thank you for a lovely week, and the weather was perfect as well....! !